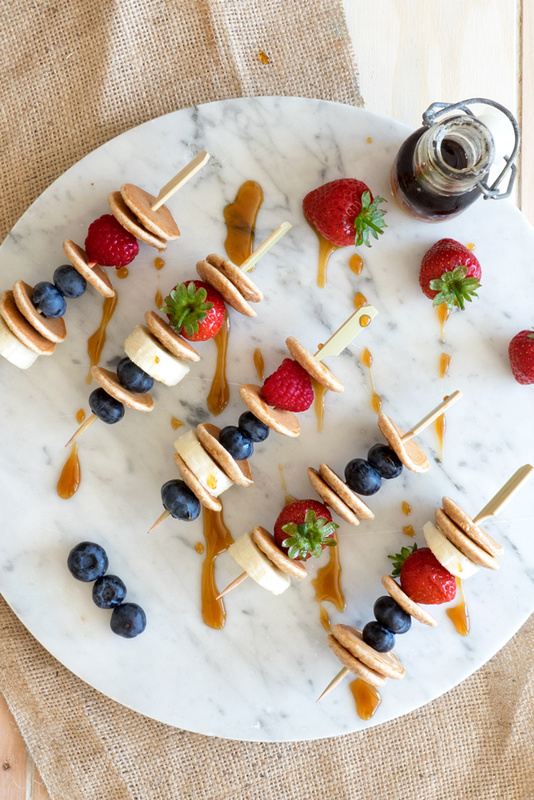 These Mini Pancake Skewers are kid-friendly, healthy, delicious, and easy to make! 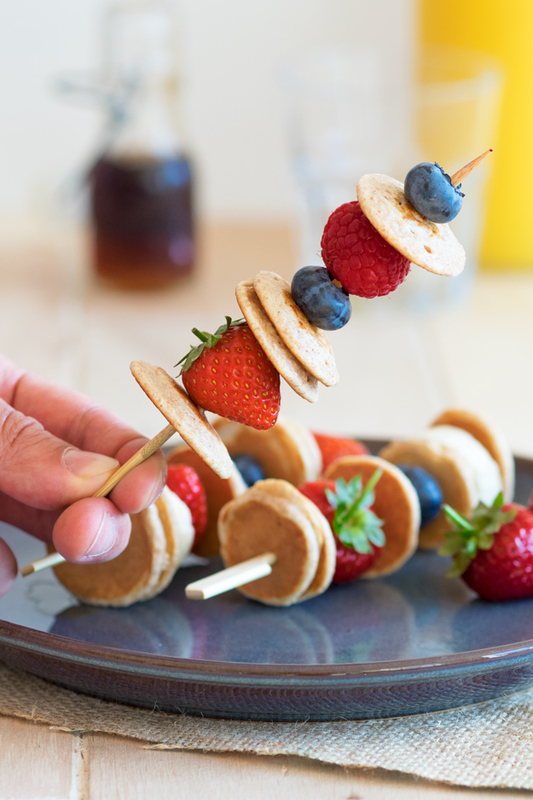 Mini Pancake Skewers are a mash up of finger-friendly foods, so they are super easy for kids to feed themselves. The mini pancakes themselves are firm enough to pick up and soft enough to bite into easily. The fruits on the skewers are all bite-sized and soft too. The eye-catching color is sure to get everyone’s attention! 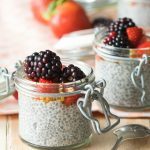 Last week, we took the challenge to eat only organic foods for breakfast since we’re in the midst of Organic September, a month long campaign by the Soil Association to celebrate everything organic. We swapped everything we normally ate for an organic version. 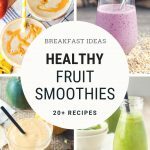 Since I’ve been pregnant, I’ve been trying to eat healthier, but raising awareness for Organic September inspired me make the full jump to eat only organic foods at breakfast. 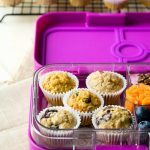 Read on below to enter the giveaway for a £30 Waitrose gift card so I can encourage you to try the same! On the last day of our challenge, we hosted brunch at our place and the guest of honor was an 18-month old toddler. 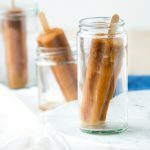 I decided to make these organic Mini Pancake Skewers, and they were such a hit with the little one! 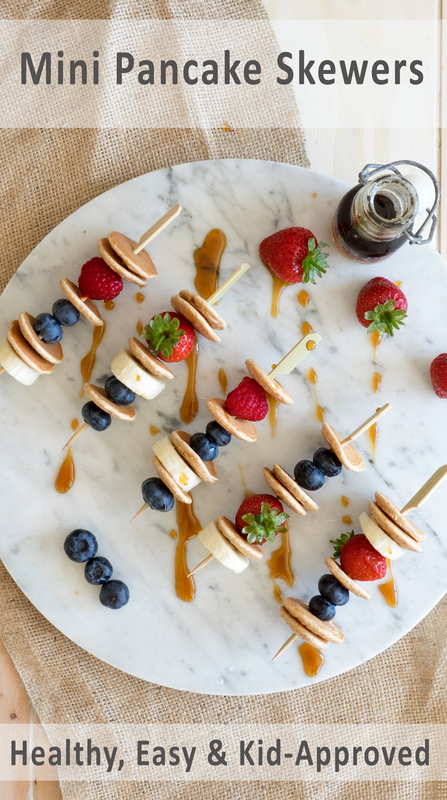 These Mini Pancake Skewers are kid-friendly, though you may need to pull everything off the skewers and hold the maple syrup when feeding young ones. 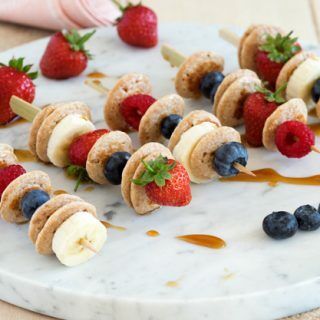 Mini Pancake Skewers are a mash up of finger-friendly foods, so they are easy for kids to feed themselves. The mini pancakes themselves are firm enough to pick up and soft enough to bite into easily. The fruits on the skewers are all bite-sized and soft too. 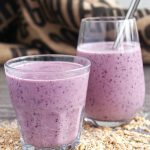 If you have kids of your own, you can always swap the berries and banana out for fruits that you know will be welcomed. The skewers are colorful and eye-catching once assembled too. The little one couldn’t stop pointing at them and saying “pwease”. Since kids can be brutally critical of food (kids reviewing fine restaurants are one of the cutest things to read), it was a satisfying moment when the toddler loved the brunch that I prepared and asked for more! 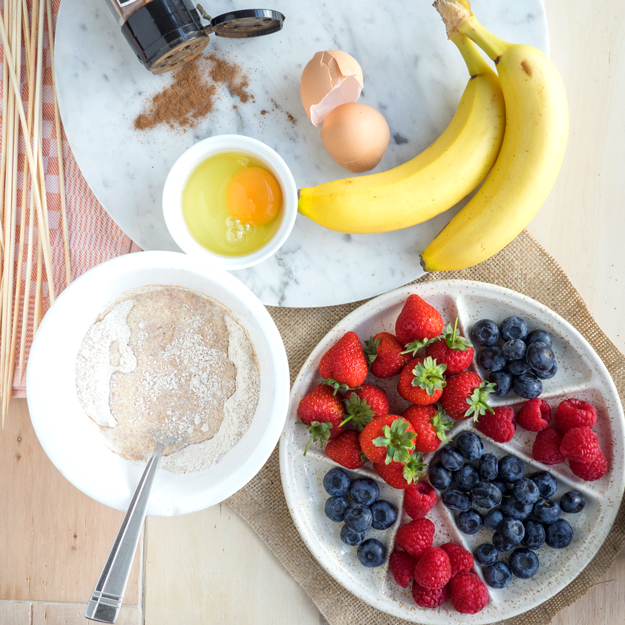 The mini pancakes themselves can also be made with a mix of whole grain flours to make them healthy. Mini pancakes are a lot more forgiving than regular pancakes to make. You only have a bite size portion of the pancake, so unlike regular sized pancakes, you don’t have to worry about the middle of the pancakes raising properly. Mini pancakes also cook a lot faster than large pancakes, so there’s little risk of the inside of the pancakes remaining uncooked while the outside of the pancakes burn. As such, you can easily mix and match whole wheat flour, spelt flour, and all-purpose flour when making these pancakes, depending on your preference. There’s still some time left in Organic September, for you to get involved! 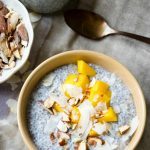 Are you able to take the challenge to swap one meal a day for the period of a week to all organic ingredients? It surprised me at how simple it was to do so. We did spend a bit more money on groceries this week by eating organic, but there were plenty of organic items on offer that we were happy to buy. 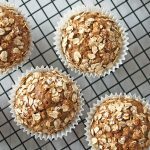 Plus, now that we have stocked up on some organic pantry staples like cooking oil, cinnamon, and flours, we’ll be able to easily make several more organic breakfasts even though the challenge is over for us. For participating in this Organic September challenge, Waitrose offered me a gift card to encourage me to try the organic range their stores (we found all the organic ingredients for these Mini Pancake Skewers there). 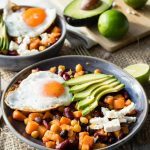 To encourage you to take on the challenge of eating organic too, I’m offering you a chance to win a £30 Waitrose gift card! Please note that this gift card giveaway is not sponsored by Waitrose, but it is my personal challenge and competition to you. 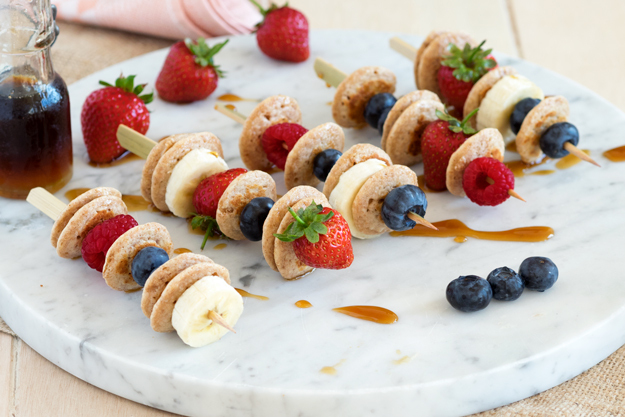 These Mini Pancake Skewers are kid-friendly, healthy, and easy to make! 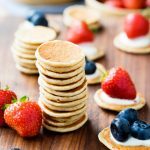 Mini Pancake Skewers are a mash up of finger-friendly foods, so they are super easy for kids to feed themselves. The mini pancakes themselves are firm enough to pick up and soft enough to bite into easily. The fruits on the skewers are all bite-sized and soft too. The easiest way to get mini-pancakes is to fill the batter into a squeeze bottle with a narrow spout (for example, one of the plastic red ketchup bottles at diners). Squeeze out the pancake batter so they are about the 1-inch (2.5-cm) in diameter. If you don't have a squeeze bottle, you can drop the pancake batter on with a small spoon. Form about 8-10 pancakes at a time, so you give yourself enough time to be able to flip the pancakes over before they burn. I didn’t see where the giveaway is limited to the UK, but if so I have an address there as well. Thanks, Dani! 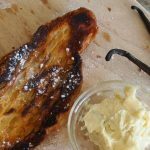 I hope you enjoy making these mini pancakes and the Maple and Coffee Glazed Bacon! Both are a favorite around here, and we can’t stop making them over and over again. The giveaway is limited to UK residents – the terms and conditions are in the rafflecopter app. So sorry, where it says put your e-mail address in to the first option above, I accidentally put my name!!! Could you please use this e-mail address to correct my error.